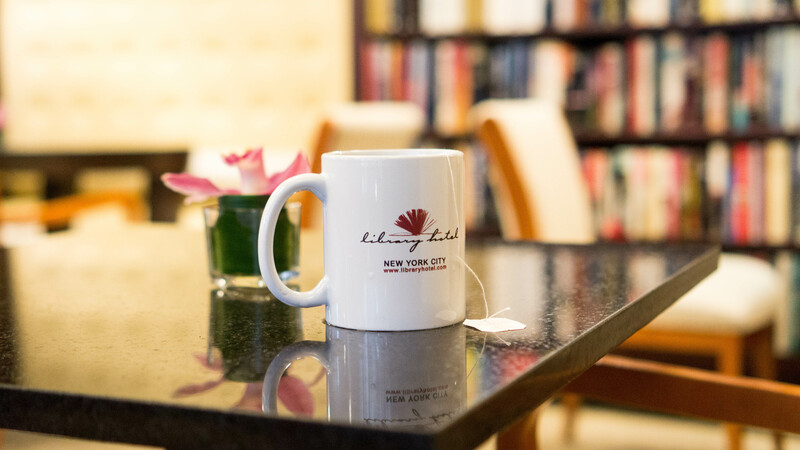 The Library Hotel, located at 299 Madison Ave, is prime location for doing a lot of tourist-y things. It’s close to Grand Central Terminal (a few minutes walk!) and the New York Public Library. It’s a 10 minute walk to the Empire State Building and Rockefeller Centre (ok this is maybe like 12 minutes.) 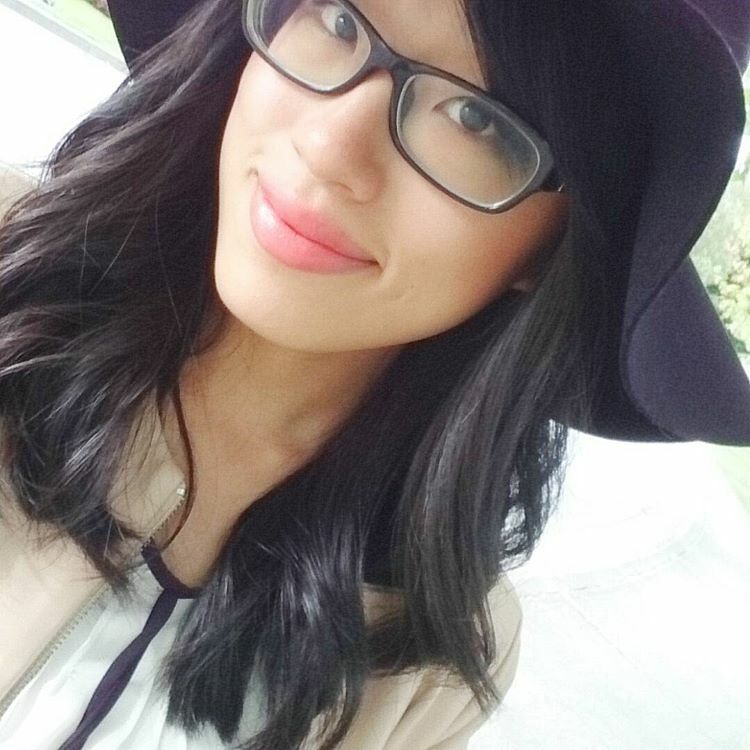 It’s close to Koreatown which means a lot of yummy food, and Time Square isn’t too far either! My friend and I stayed in the Petite Room with one Full Bed. 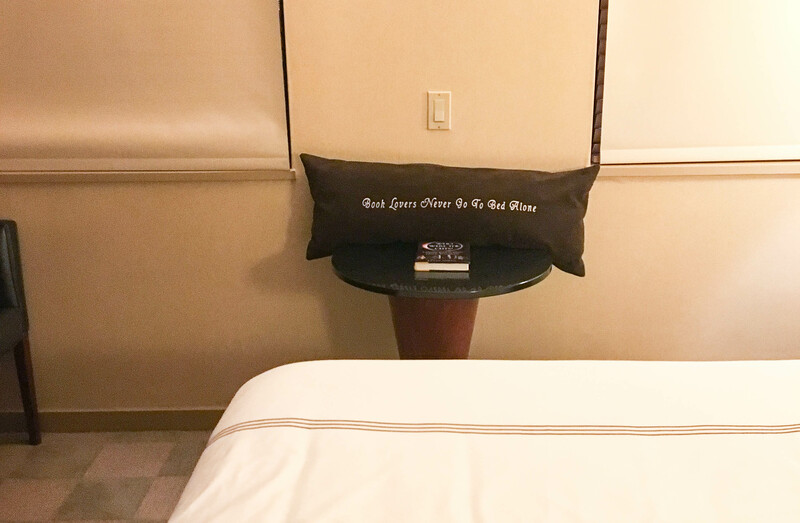 When we arrived inside, my eye went straight to the cute pillow “Book Lovers Never Go To Bed Alone.” (Sorry for the HORRIBLE lighting. I didn’t take a photo with my mirrorless camera and I only used my iPhone in dark lighting.) There wasn’t a lot of room to fit our bags and suitcases; if you’re a solo traveller you will like this more than if you were with someone else. 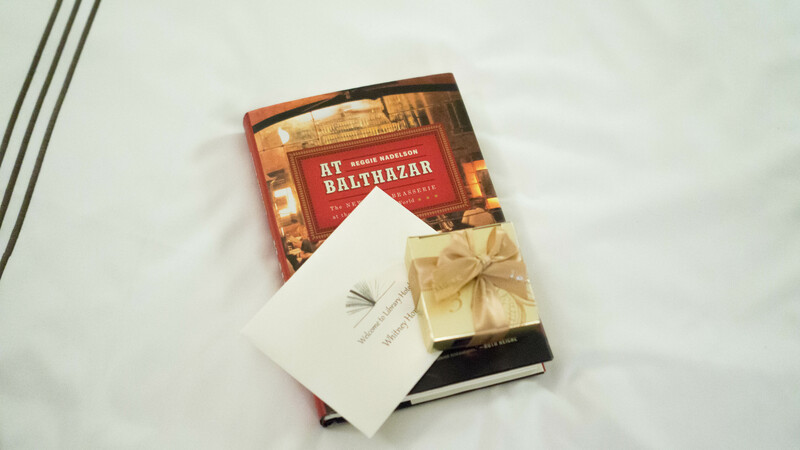 Upon arrival in my bedroom, I was greeted with vouchers to the hotel’s rooftop lounge, chocolates, and a new book, At Balthazar. I haven’t had time to read it yet, but it’s about the restaurant and exploring the history of downtown Manhattan. New York is a really rich city and hopefully I’ll find time to read the book soon. 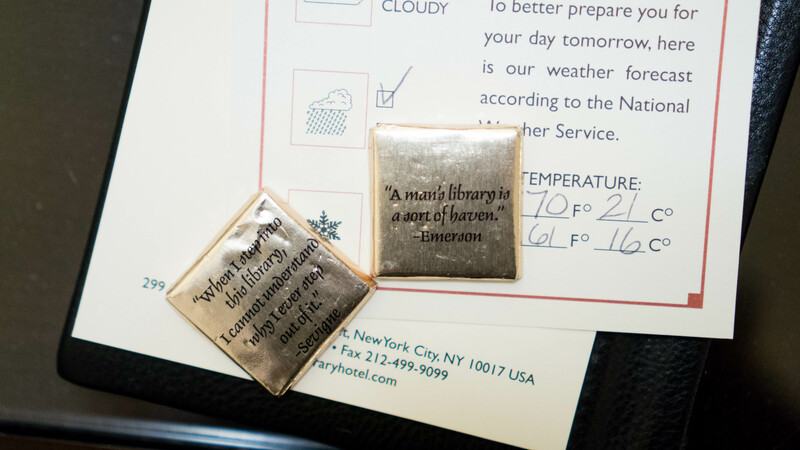 Since I did come from the sister hotel of The Library Hotel, it’s hard to not compare and make notes of what’s different. 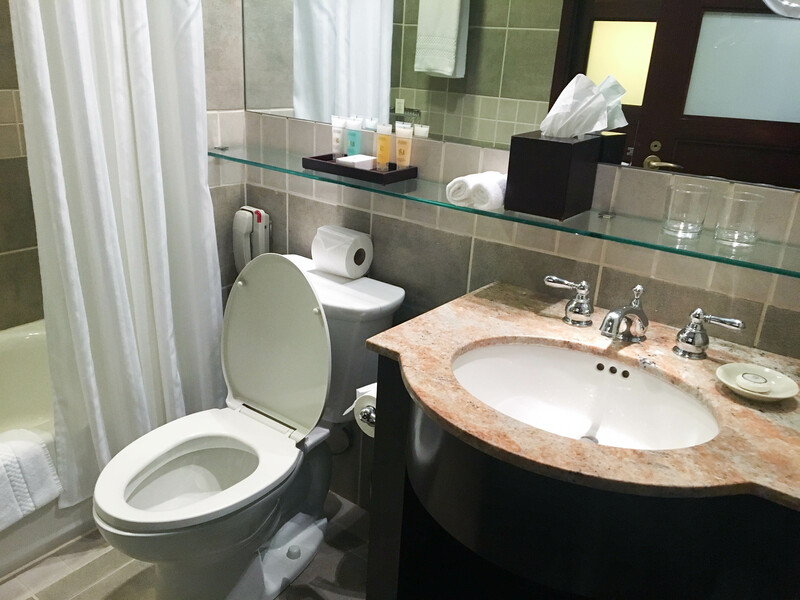 This washroom is much more spacious, modern, and has a lot of surface for me and my friend to layout our thousand bottles of moisturizer and makeup. But there’s something timeless I love about Hotel Elysee’s marble walled bathroom. I really liked The Library Hotel’s washroom though; it was very easy to organize our stuff and to have our clothes placed in a specific area while we were showering. Similar to Hotel Elysee, The Library Hotel also has complimentary breakfast in the morning and a cocktail reception in the evening with wine and cheeses. There’s also coffee, tea, and pastries 24/7. The food and drinks were set up in a super cozy lounge on second floor, with bookcases and comfy seats. I forgot his name, but my friend and I often hung out here at 11pm-midnight (after a day of walking and shopping we just wanted some tea,) and one of the staff was very attentive and offered us wine at night! 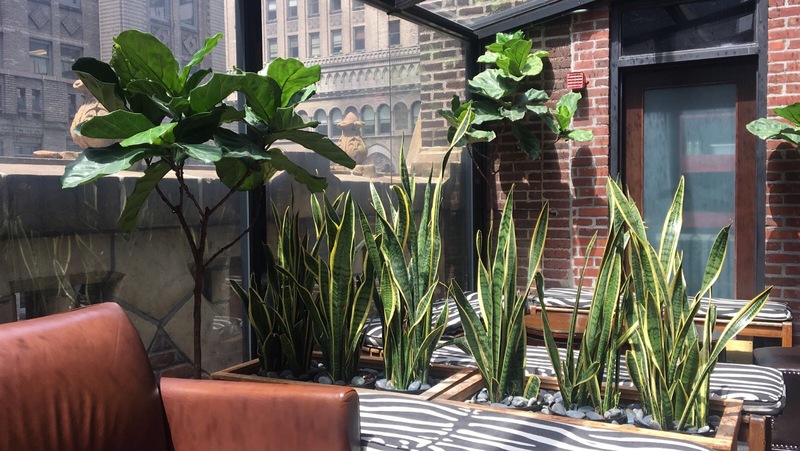 At The Library Hotel, the rooftop lounge called Bookmarks. I had two drink vouchers between my friend and I. Some of the drinks had really cute names related to books, such as “Bookmark’s Hemingway,” or “Dante’s Inferno.” Because I’m weak AF, I got the Lychee Rose, a combination of sparkling wine, lychee-rose puree and combier liqueur de rose. I don’t know how to talk about the quality of alcohol in a cocktail, but i had a wheee fun time after this. To be honest though, not sure if I’d pay $15 USD for one, given how lightweight I am! When we had time to come up at night, it was dark and rainy so I couldn’t capture any good photos. The day I flew back to Vancouver, we came up to check out the lounge in daytime; and danggg it is GORGEOUS. I miss this space already and wish I had more hours to do some outfit shots and pretending to be classy with a glass of wine in my hand. Because The Library Hotel was so close to so many attractions and places to go/eat, I did a LOT of walking (like 20k steps per day according to my Fitbit!!) 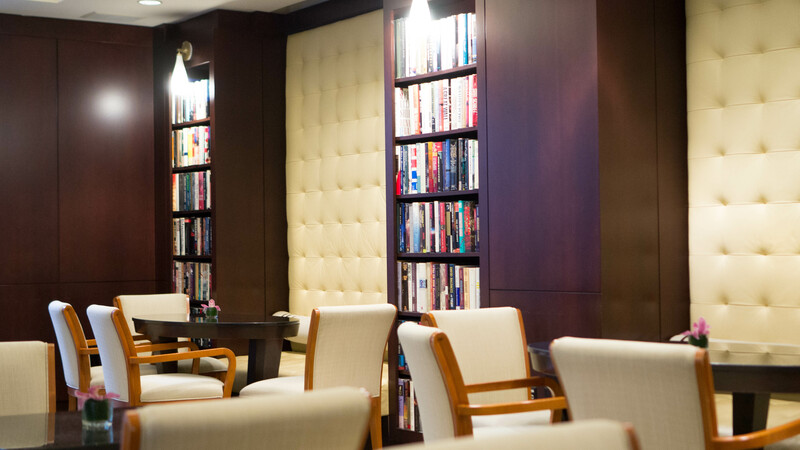 This boutique hotel is just as cozy as Hotel Elysee- with books and complimentary wine, coffee, AND hot water (my favourite!) This is a very quaint location to relax and if you want to escape the fast paced New York city life. Disclaimer: I received one night stay and 2 nights of media rate in exchange for a blog post. All opinions are my own.